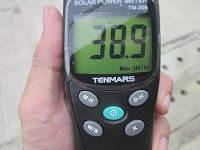 measurement range up to 1999 W/m2 or 634 BTU/(ft2*h). All parts are of professional quality and Made in Taiwan. & safety standards (CE Marking).